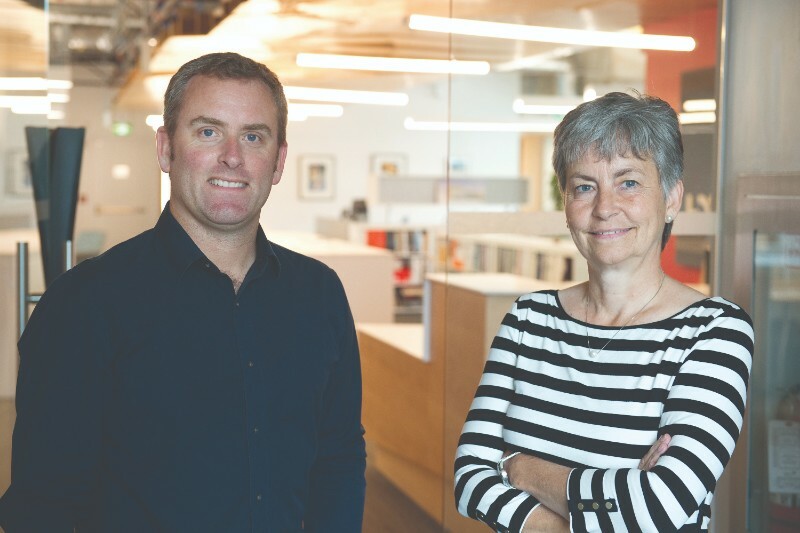 The first thing visitors notice upon entering HDR Architecture Associates, Inc.’s Westboro location is the ceiling – specifically, an overhead wooden carved abstract map of Ottawa that runs the length of the office, drawing one’s eye across the space. Jason-Emery Groën, vice-president and design director at the architectural firm, says he loves to hear the various questions visitors ask about the ceiling piece, as well as listen to people at the office explain it from their point of view. The story told by the installation reflects the importance the firm places on local history and on understanding the context of each new project they take on. “The ability to tell stories is central to our craft,” says Groën, and the ceiling piece tells a tale that’s important to HDR’s work in the region: the story of our Nation’s Capital. The installation is made of more than 170 computer-numerically-controlled cut pieces carefully arranged in an abstract grid that traces Ottawa’s evolution through a “topography of time,” explains Groën. LTR Industries in Ottawa worked closely with the HDR team to develop the ceiling panel system, innovating at every step of the way. Running lengthwise are the confluence lines, or the key waterways Ottawa was originally founded upon, alongside later transportation corridors such as Baseline Road and the Queensway. “Where the natural rivers, the man-made concession line, and the heavy influence of the evolution of transportation have fundamentally transformed the Valley” – that’s the narrative Groën and his team wanted to convey when they designed and installed this piece themselves. Storytelling is a key element in design, going beyond simply functional solutions to help clients convey their identity, core values and message. The intricate ceiling installment highlights the firm’s ability to interpret a client’s story. 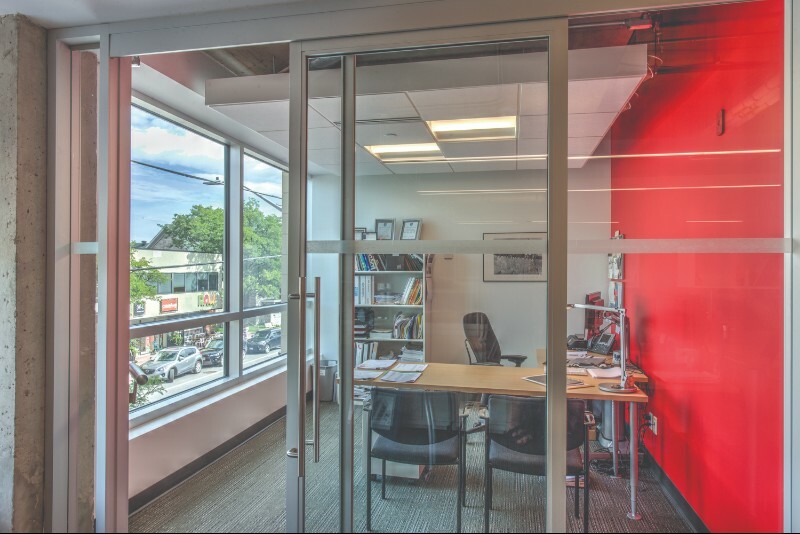 One of the unique features of HDR’s Ottawa space are the windows on both the north and south-facing walls. When one enters and walks past the welcome desk, the office is naturally illuminated from both sides, with an outdoor patio stretching the length of the south wall. “It’s really rare that you can see right through a commercial building in our North American context,” says Groën. 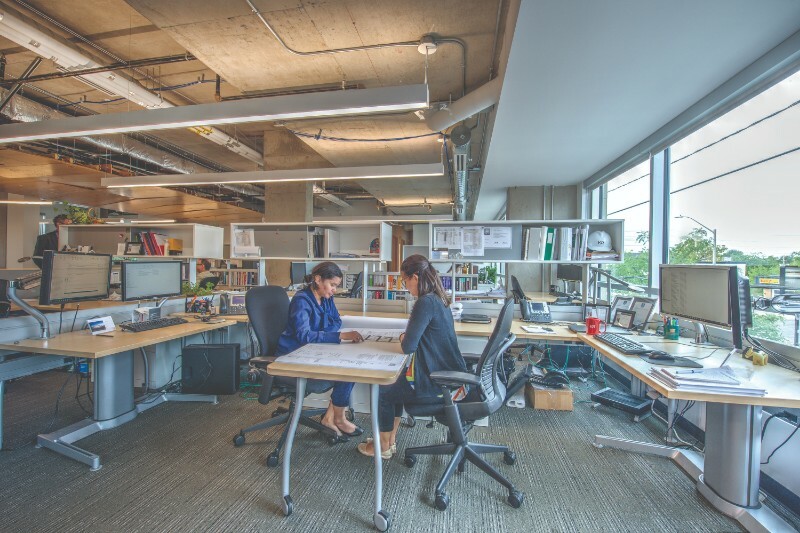 To make the most of all that natural light, the open-concept working areas are separated with low dividers, rather than traditional taller cubicle walls. A few offices and meeting rooms are along the flanking sides of the floor, with glass doors and walls facing inward to make the most of the borrowed light. Groën says the open-concept layout of the working spaces facilitates learning and collaboration, and the lack of sound walls hasn’t made things louder – if anything, he says people are more mindful of each other. The office is quiet but with a productive buzz, and Groën says people with offices end up in the common space for meetings and conversations; the office was designed with collaboration and learning in mind, a hallmark of HDR’s identity as a firm. "This space is about working together." “This space is about working together,” he explains. 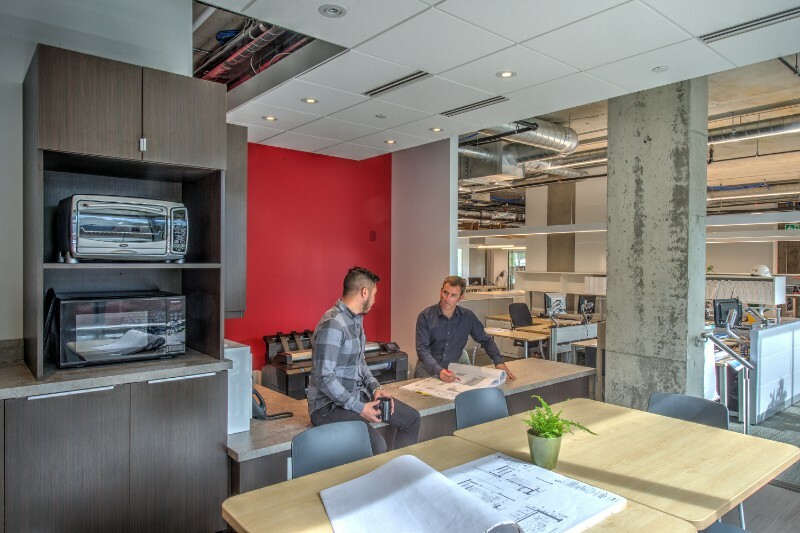 Groën points to a long white cabinet in the centre of the office below the ceiling installation that’s a popular place for meetings and to collaboratively review plans and projects. The open-concept floor plan also fits into one of HDR’s key values: transparency. “Just like the space is meant to be open and honest … our employees are just as open and honest about the work we do,” Groën says. Clients often don’t understand the work of an architect, and this office space is meant to represent HDR’s efforts to remain open and communicative about what they do. When a client walks in, Groën and the HDR team want them to feel included in the architectural process from the start. This openness is represented in the close proximity of the welcome desk to the rest of the office as well as the visibility of HDR’s employees at their desks, which not only lets light travel throughout the space but also lets clients and visitors in on the architectural process in a collaborative way. Even the exposed ceiling elements, softly uplit by suspended fixtures, add to the effort HDR has put into showcasing the firm’s priorities and processes. Photos of past projects line the walls, showcasing the firm’s presence in an ever-growing diversity of sectors including healthcare, education, science and technology as well as civic. It was originally health care that brought the firm to Ottawa in 1999: the St. Vincent Hospital, a project led by vice-president Ingrid Felso. “The firm solidified its presence in the nation’s capital by building upon the experience gained working on the St. Vincent Hospital Project,” says Felso, highlighting how joining HDR gave the firm access to global expertise. “We’re a multinational global firm, but we pride ourselves on being local,” says Groën. Current projects even involve in-depth research into the national archives or focused community engagement sessions to best understand both the history and present context in order to inform the best path forward in their design efforts.